St. Louis special-occasion restaurant is legendary for its service and cuisine. Dress code: Business casual Tues.-Fri., Jackets required Sat. : Tony's continues to provide the most attentive service in town, and it’s the only restaurant that finishes the meals tableside; for example, the signature dish, lobster albanello, with the chunks of sautéed shellfish heated in the creamy sauce with wine and mushrooms. The deboning of the Dover sole is still more dramatic, but it’s nothing compared to the dessert flambés. Alternatively, we can also recommend the steaks, osso buco, rack of lamb and veal trio. There’s a chef’s tasting menu for two worth mentioning, too, for its beef tenderloin with foie gras. If none of that matches your mood, order something not on the menu, and no one will bat an eye. Elegant and austere décor includes neutral walls and statues throughout the larger dining room. The dress code has relaxed a bit (though jackets are still required on Saturdays). 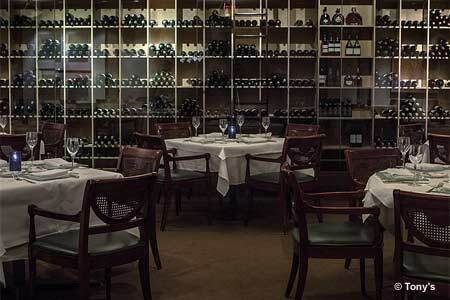 The wine list is enviably long and broad, and it’s quite reasonably priced for the setting.